This week flew by! It's probably due to the fact that I worked three days. AND, I am gearing up for another three day week, Thursday through Sunday, I will be in Denver for the NTA Summit, Fuel Adventure, improving proformance by going back to the foundations of health. I am going with a fellow NTP and friend, Jenn Schroeder. So excited! Anyway, back to the weekend. Friday, my team at Fifth Third had an outing. We called it the three B's. The first B was breakfast, at my favorite spot, Sleepy Bee. I ordered the Broakley, a breakfast sandwhich with bacon, sprouts and egg on gluten free bread with a side of roasted sweet potatoes. My boss ordered a round of coffee. My cup was never empty, after breakfast, I was buzzin'! After breakfast, we headed to Madison Bowl. It had been awhile since I've been bowling but I was excited to get started. After a few frames, I got warmed up and ended up doing pretty well! 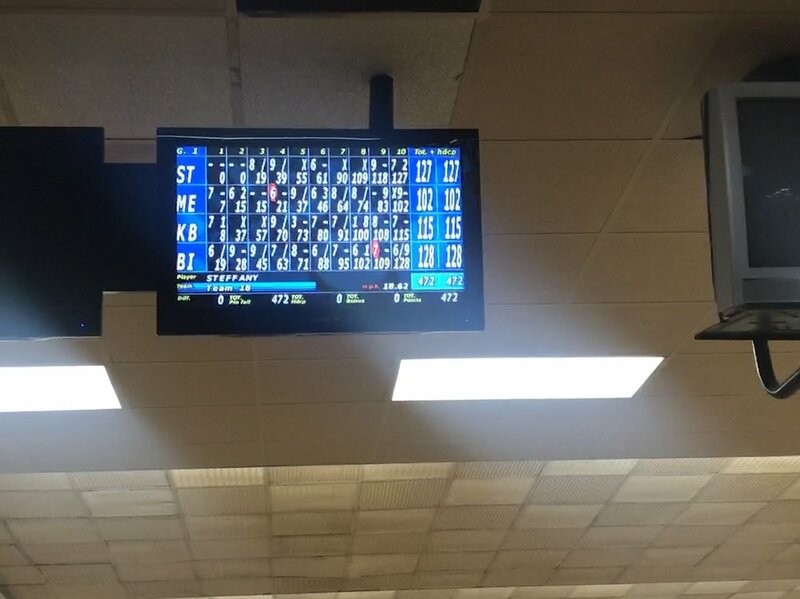 I was only one pin behind my boss after the 10th frame. Pretty proud of myself. Though the first game was my best, I'll take it. We bowled a few more games, had a drink and then headed out after a couple of hours. It was only 1:30 p.m. by the time it was all said and done, so me and co-worker walked up the hill to MadTree, a local brewery. They don't have anything but beer, so I sipped on water as we chatted. An hour or so later, Andrew showed up, He snuck in a couple of ciders for me. I sipped on those as the boys drank beer. After awhile, we were getting hungry. I ordered a couple of appetizers from Catch a Fire Pizza, which is located inside MadTree. They had a lot of great gluten free options. I was impressed. I ordered the jerk wings and jalapeño popper potato skins. Yum! After another drink or two, we headed to dinner at Arthur's, a local burger joint. We enjoyed another drink or two, shared chicken nachos and each ordered a burger. Saturday morning I got up and took a walk, made a simple breakfast and headed to hot yoga at Body Alive, a local studio. The classes are hot, which I love. It was great for a good stretch and to sweat out the alcohol from the night before. After class, I showered and did a bunch of laundry. Around 1:30 p.m., I picked up my friend and we headed to Blooms and Berries Farm Market to meet some friends. We had a great time stumbling through the corn maze, petting the goats and bouncing around on a hay ride. Nothing like an 85 degree day to kick off the fall festivities. After the pumpkin patch, I headed home. I was pretty pooped from the day and poor sleep the night before. I cleaned my apartment, made a quick salad crashed on the couch watching 'The Jinx'. I took a 45 minute nap, chatted with Andrew and started packing for my trip to Denver. After awhile, I got bored with that and went on a walked to listen to the latest season of 'The Accused', a unsolved murder podcast hosted by The Cincinnati Enquirer. I love it for it's local flair. I listened to an episode and came home to finish up some laundry and another episode of 'The Jinx' before heading to bed. Sunday, I woke up before 7 a.m. and got started on my to-do list. I wanted to get some business stuff taken care of before I head out of town on Thursday. I made some coffee and got started on a couple of posts. After a couple of hours, I sat down for breakfast. 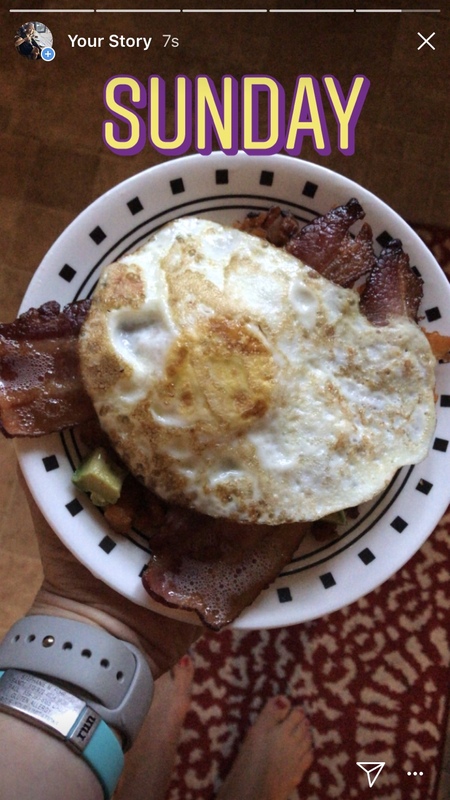 I put some bacon in the oven, fried and egg and put it all on top of roasted butternut squash and avocado. I ate and then got back to work. I was jacked up on coffee and feeling pretty productive. I finished up the posts I was working on, cleaned up and headed to the grocery store for few things. Around noon, I realized I was a little hungry so I had a couple pieces of toast with sunflower butter and strawberry jam. I am making a conscious effort to eat more carbohydrates. I've learned that it's really hard to do with whole foods, so adding gluten free grains to my diet is a must. I snacked on the toast as I watched some vidoes for a nutrition program I'm enrolled in. After an hour or so, I started getting restless, so I put on my running shoes and headed out for a 3.5 mile run. I kept it really easy, running around a nine minute pace. I walked the rest of the route home and made a little lunch out of deli turkey, Simple Mills crackers and an apple with almond butter. After snacking, I finished up the first module of my program and did a few things around the house.